Unlimited individuality for performance & comfort. Damping forces can be adjustment separately in rebound & compression. 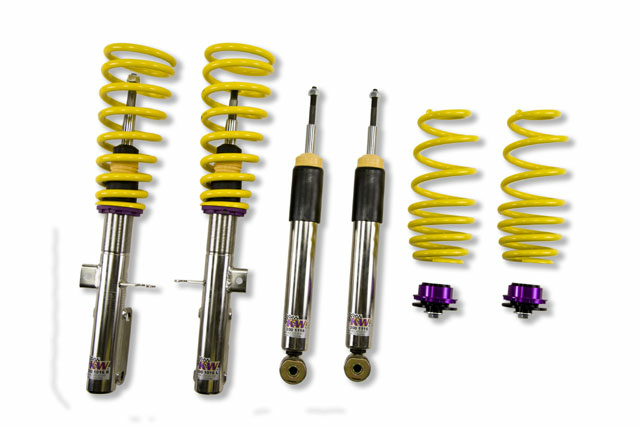 Our engineers have developed a sporty yet harmonious basic setup, as with any KW coilover kit. To be able to guarantee the perfect suspension setup we test on our KW 7-post rig, as well as extensive driving tests on country roads, motorways and even on the N�rburgring Nordschleife. For years, the KW coilover kit Variant 3 "inox-line" is one of the top aftermarket products and is a benchmark for coilovers. It convinces sports car drivers, tuner, large-and small series manufacturer such as Alpina, MTM, Manthey, Oettinger and many more leading companies in the international automotive industry with its damping characteristics, quality finish and durability. With the KW coilovers Variant 3 "inox-line" you will get much more than just a sporty lowering and excellent driving behaviour on all roads. It is based on our long experience as a suspension manufacturer and supplier for international motor sport, such as the touring car series ADAC GT Masters, FIA GT1, FIA GT3, International GT Open, WTC, VLN and the legendary ADAC Zurich 24h-race N�rburgring. Similar to our racing coilovers from the KW Competition program, the KW coilovers Variant 3 "inox-line" can be adjusted independently in compression and rebound damping. This individual adjustment possibility is much appreciated by sports car manufacturers, tuners and drivers worldwide. If you have already made your first performance modifications to your vehicle our KW coilovers Variant 3 will compliment your upgrades. The patented KW-valve technology for separate adjustment of rebound and compression damping allows you to individually setup your suspension.The adjustable KW bottom valve adjusts the low-speed range of the compression level in twelve clicks. You don�t need any adjusting tools because of the patented compression adjuster at the lower end of the stainless steel housing. The adjustable compression damping with its twelve exact clicks allows you to manually influence body roll, without having to change the spring rate which optimally matches the rebound. 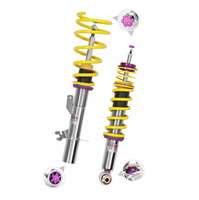 With the individually adjustable rebound setup of the KW coilover Variant 3 "inox-line", you can directly influence the handling and comfort with its precise click adjustment. Depending on the vehicle type, the rebound valves of the KW twin-tube dampers on the upper end of the piston rod will be adjusted via an integrated adjustment wheel or a twist-adjustment wheel which is included in the delivery content. By increasing the rebound force via the adjustment wheel body movements are reduced. You will have more stability during high speed cornering. If you change for example the wheel / tire combination (approved by the car manufacturer) to larger wheels, then with a KW coilover Variant 3 "inox-line" you will be able to adjust the car's handling perfectly. The KW coilover Variant 3 "inox-line" kit and every single damper are subject to extensive quality tests during production to meet the high standards of our KW quality management. This is the only way we can meet our expectations to give up to five years warranty on our KW coilover Variant 3 "inox-line" when installed at one of our KW specialist dealer. 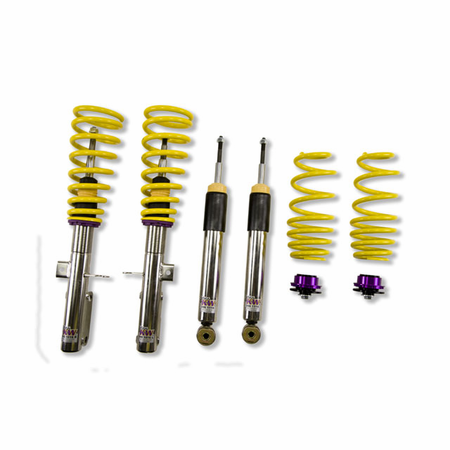 KW coilover struts made of stainless steel are 100% rust-free and an unlimited life time. Therefore the operation of the continuous lowering via the dirt-resistant KW trapezoid thread and the KW composite collar is also not affected after years. By the individual lowering with its continuous adjustment range, you can emphasize the sportiness of your vehicle visually. A feature that is very popular in the performance-oriented tuning scene. Below is a list of vehicles this part is compatible with. However, please click the link below to view additional fitment notes to confirm if this part will fit your vehicle. If you are unsure whether this part will fit your vehicle, please contact us before purchasing. Copyright 2005-2018 Sparktec Motorsports. All rights reserved.